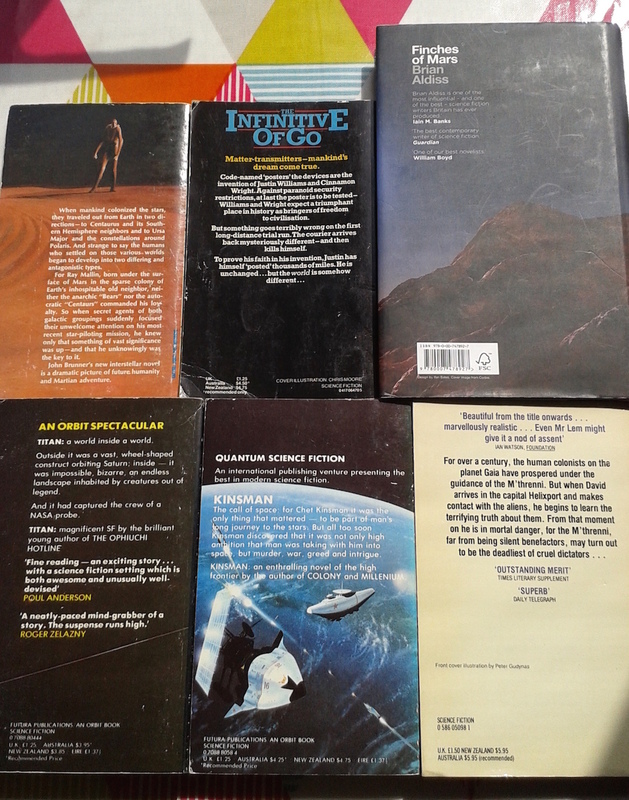 Top row, left to right: Born Under Mars by John Brunner, published by Ace (US) in 1967, cover by John Schoenherr; The Infinitive of Go, also by John Brunner, published by Magnum in 1981, cover by Chris Moore; Finches of Mars by Brian Aldiss, published in hardback by The Friday Project in 2013, cover design by Ifan Bates. 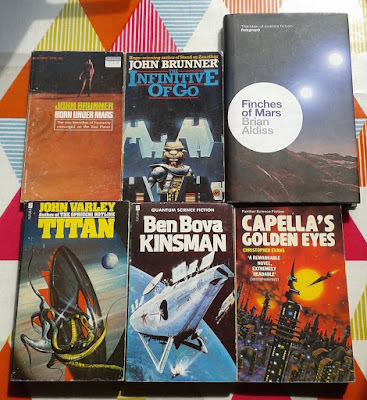 Bottom row, left to right: Titan by John Varley, published by Futura/Orbit in 1979, cover by Peter Andrew Jones (with interior illustrations by Freff); Kinsman by Ben Bova, published by Future/Orbit in 1979, cover by Colin Hay; Capella's Golden Eyes by Christopher Evans, published by Granada in 1982, cover by Peter Gudynas. I was especially pleased with the Varley and the Evans – Varley is an author I'm very interested in right now, while Evans is a name I'm unfamiliar with but who comes recommended by Christopher Priest – but they all look promising, and together constitute quite a nice little score, all the more so for being so unexpected. 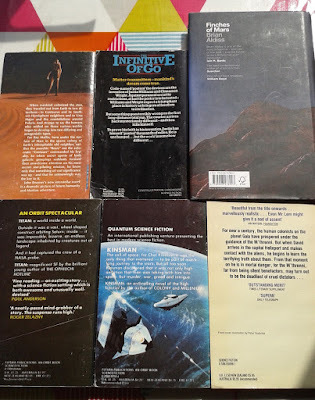 The temporary stall-holder told me the books were his rather than the regular proprietor's and that he had more science fiction in storage, which he would dig out and bring along on a day I would be likely to be passing, if the weather was clement. I've been by the stall a couple of times since – on clement days – but as yet no luck. I live in hope. I have enjoyed the Kinsman books, and had a compendium of the saga at one time. I've also read the Varley, many years ago, and remember liking it at the time, though I don't know if it will had held up. 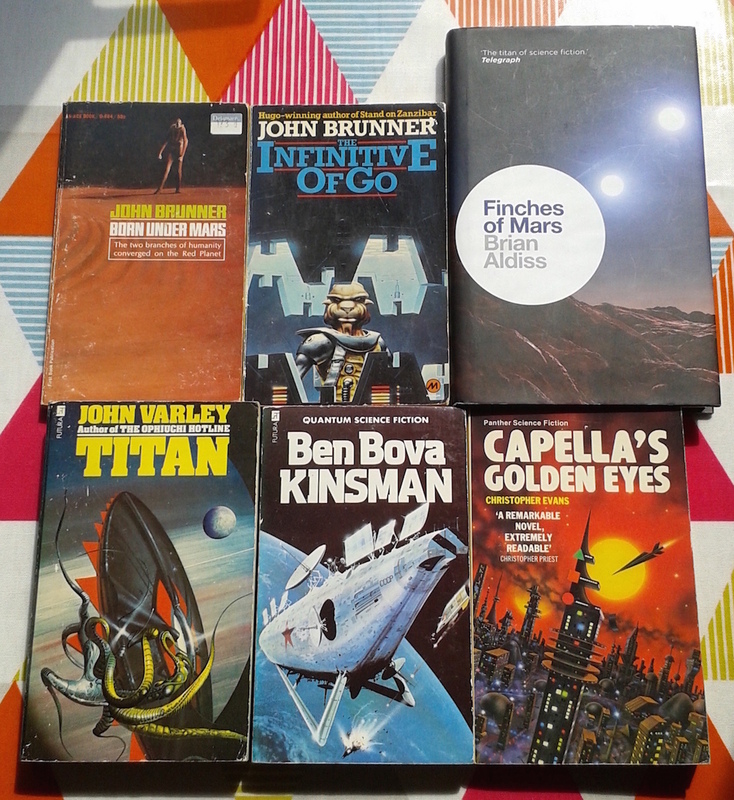 I've read some Brunner, but not these, and the other book is totally unfamiliar. Good luck in your quest to find more SF. Thank you, Rick – and for the notes on Bova, Varley and Brunner. Loved Varley's work, really didn't like TITAN when it appeared. Took a while for Varley to write a novel nearly as good as his shorter work. I've only read a couple pf his shorts so far, Todd, which I liked, but I really liked Ophiuchi Hotline. Very nice. My son has been after me to read Titan by Varley for a while. I guess I ought to listen to him. I shall look forward to your thoughts on Titan, Tracy! Good luck in your quest to find more SF.